On October 21st 2006 I attended the Otis Chandler auction in Oxnard, California. 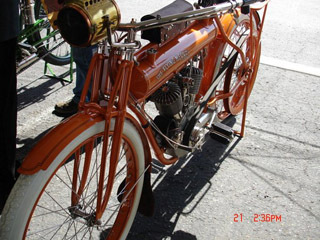 My main purpose for attending was to buy the 1911 Flying Merkel motorcycle that was being offered. Although the Gooding and Company auction catalog listed its estimated value at $65,000 to $75,000, I knew the bike was worth much more. I was prepared to pay $100,000. The bidding started at $5,000, and quickly rose over $75,000 with only myself and one other bidder still interested. When the bidding got to one hundred thousand dollars, I was outbid again, and, although I had said from the beginning that I would not exceed that number, I bid the bike to one hundred and ten thousand dollars. You must keep in mind that the auction people add a ten percent fee to the highest bid, therefore, my final price would have been $121,000. I was quickly outbid at $115,000, and I decided that I had bid enough. While at the auction, I met a gentleman who told me he knew where there was the same bike available for sale at a much lower price. The bike, of course, was in ten thousand pieces, and was referred to as a "basket case". I bought that dubious pile of gems a few hours later. Hence,the following photos will take you through the process of a complete restoration of our "NEWEST PROJECT"
You will see this Merkel transformed from its basket case condition to a show quality restoration equal to, if not better than, the Otis Chandler piece.